I entered the mileage game last October with the Chase Ink Plus‘ incredible sign-up bonus of 70,000 Chase Ultimate Rewards points (now 50,000 points), and although I was already well-traveled at the time, I didn’t know the value of these points or the 10 great options for redeeming them. 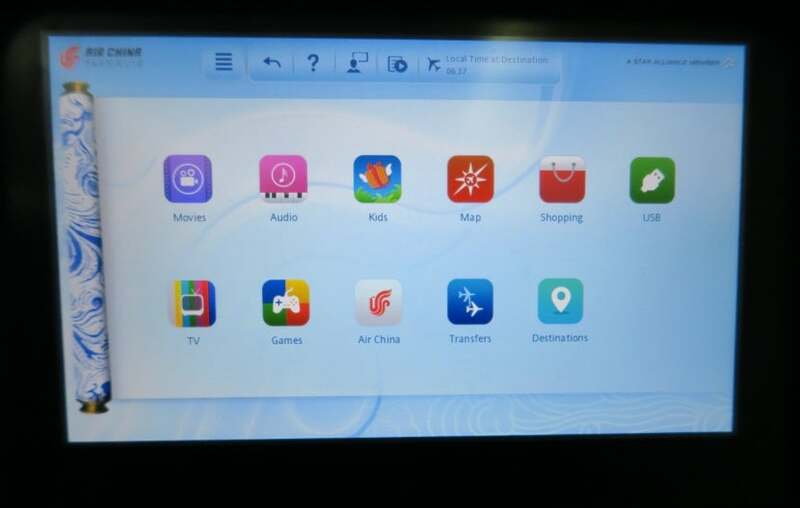 However, I eventually figured out that these points — when transferred to United MileagePlus — would yield enough miles to fly economy to/from China to attend RoboCup 2015, a celebration of both robots and soccer. My transfer of Chase Ultimate Rewards points to United miles was nearly instantaneous, and there was plenty of availability when I booked my outbound Austin (AUS) – Hefei (HFE) itinerary. (Hefei, the capital of China’s eastern Anhui Province, is where the RoboCup competition was held this year.) I used my new United MileagePlus Explorer card to pay the $13.60 taxes and fees, and to utilize the cardmember benefits of priority boarding on the United legs and slightly improved chances of an upgrade on the first leg. My AUS-SFO-PEK-HFE itinerary on United. 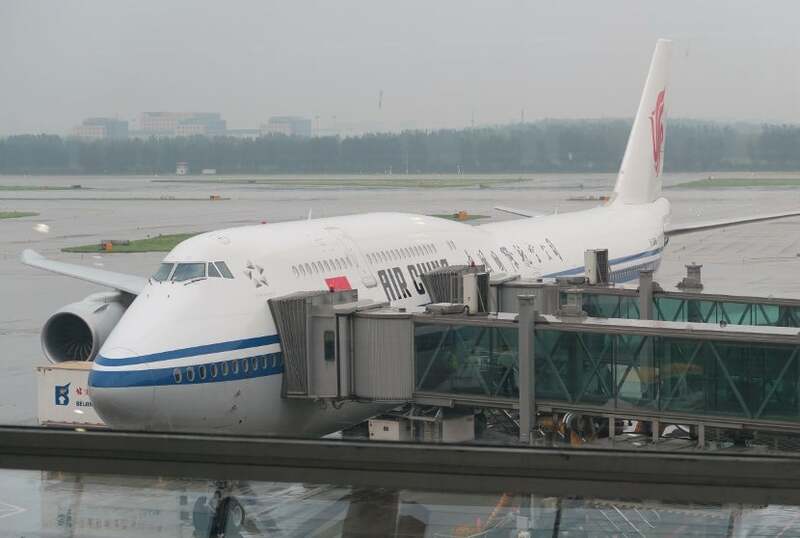 A few weeks later, I checked back and found availability on Star Alliance partner Air China’s 747-8 from San Francisco (SFO) to Beijing (PEK) and was curious to experience both the 747-8 and Air China. I called United customer service, and after about an hour of holds and transfers, was able to change my SFO-PEK leg from United to Air China. While I had to battle for this itinerary, I have since found the same itinerary bookable through the United website (see the screenshot above with the $75 close-in booking fee). Shortly after booking, I called Air China to select seats (call 800-882-8122 and choose option #3). I declined paying an extra $100 for a seat in the front of economy, as I had read on FlyerTalk that you can choose these seats for free at the check-in counter. 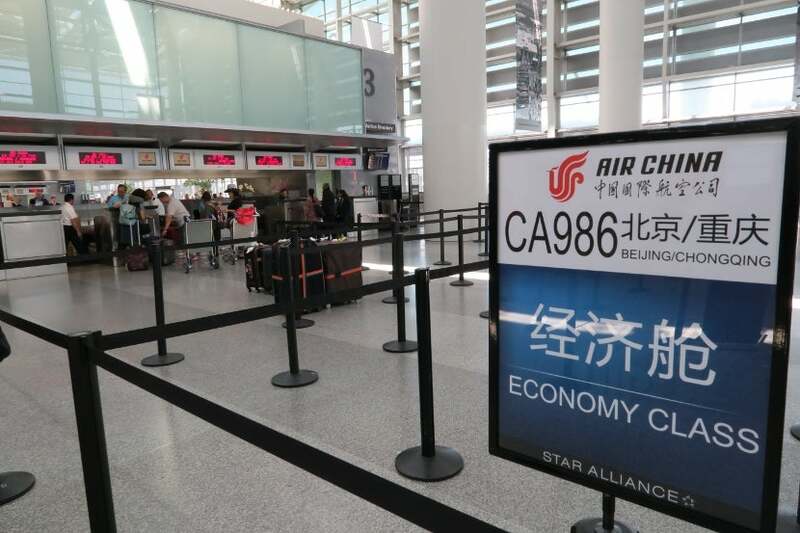 The Air China economy-class check-in counter at SFO. 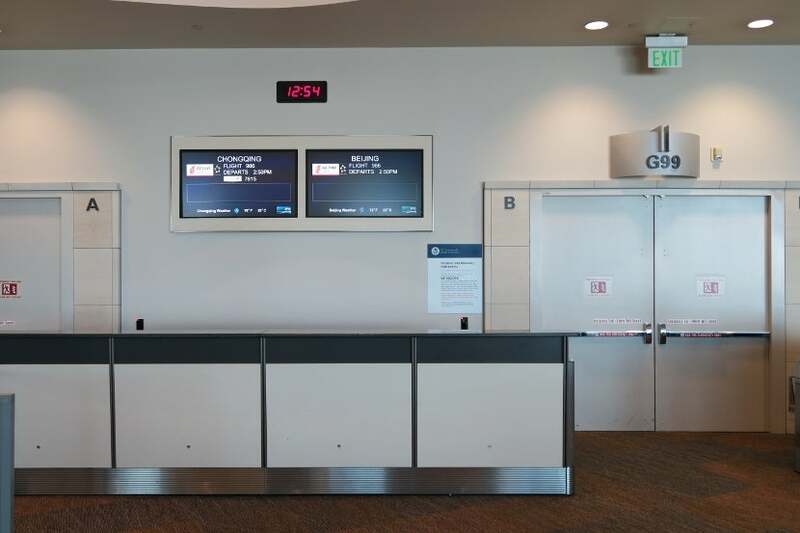 Once in San Francisco, I headed for the Air China check-in counter at SFO. I asked the Air China desk agent for a forward window seat and got 40L, the third row of the economy cabin. She tossed my United boarding pass and printed a new Air China boarding pass (unfortunately without TSA Precheck). It turns out that I would have needed an Air China boarding pass to board anyway, and gate agents automatically print these for passengers connecting from other airlines. A heck of a long line to enter to the United Club Lounge at SFO’s Terminal G.
Outside the United Club (set just inside security at Terminal G) was a long line of people waiting to enter the lounge, so despite my having a United Club pass via my United MileagePlus Explorer card, I decided to not bother and instead just headed down Terminal G toward my gate. The Converge room/lounge at SFO, near gate G93. Near gate G93, there is a room called “Converge” which is designed to help connect interested passengers. 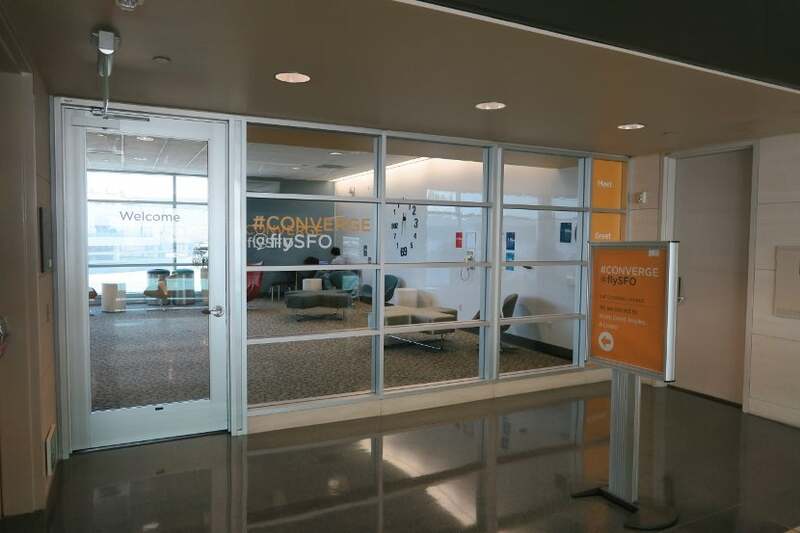 You’re supposed to enter and write what you’re interested in discussing on the whiteboard walls; in practice, however, Converge is a free lounge featuring comfortable chairs, plenty of power plugs and the airport’s free Wi-Fi. The Wi-Fi here had a decent 2.97 Mbps download and 1.85 Mbps upload (5 ms ping). 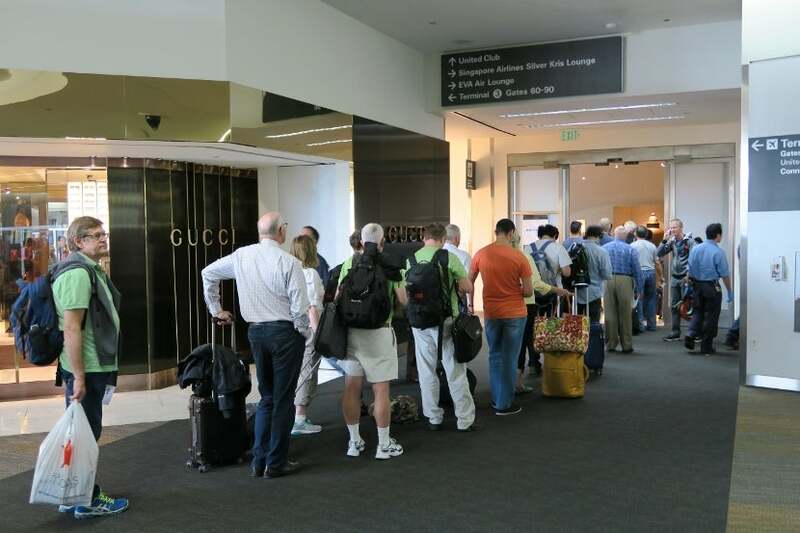 It was a quiet alternative to the United Club, and far from packed. G99, the SFO gate that Air China uses for its daily flight to PEK, is at the farthest end of Terminal G — so leave extra time to get there. Gate G99 isn’t marked with any permanent Air China signage, but it might as well be; it seems to be the gate that the airline uses daily for Flight 986 to Beijing. G99 is at the farthest end of Terminal G, so keep that in mind if you have a tight connection in SFO. The economy cabin aboard Air China’s 747-8. Upon boarding, I found that seat assignments were only loosely adhered to by my fellow and mostly Chinese passengers. After some swapping of seats, a young Chinese guy seemed genuinely excited to sit with me. He took the aisle and I took my assigned seat at the window; we had no middle seatmate. It soon became clear how important it was to move my seat forward in the cabin, as this section had many more empty seats than the back of the plane. 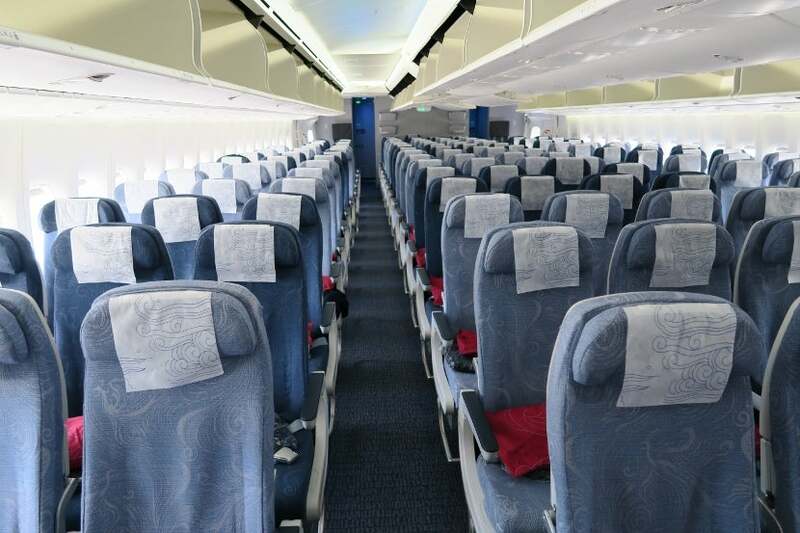 For instance, row 38 (the exit row and first row of economy) had two passengers; row 39 had one; and rows 40-41 had two each, making the 3-4-3 configuration seem less crowded than it might otherwise feel. 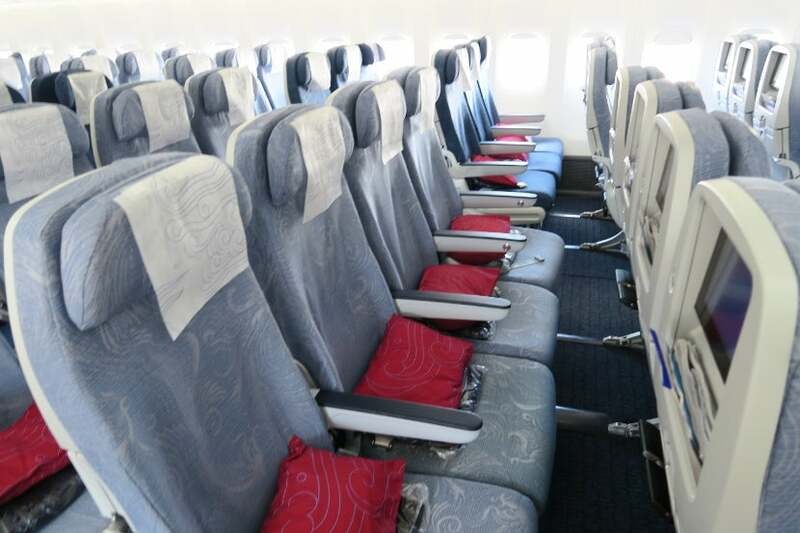 The economy seats, arranged in a 3-4-3 configuration, offer decent width, legroom and recline. I found the seats to be pretty pleasant, with decent width, legroom and recline, and included foot rests. There were no amenity kits provided; simply a pillow (with no packaging), a plastic-wrapped blanket and plastic-wrapped, over-the-ear headphones. These basic headphones — think 1990s Walkman headphones — were of poor quality and didn’t fare well against the noise of the cabin. So when using the entertainment system, I opted for my own earbuds with the necessary two-to-one prong converter. 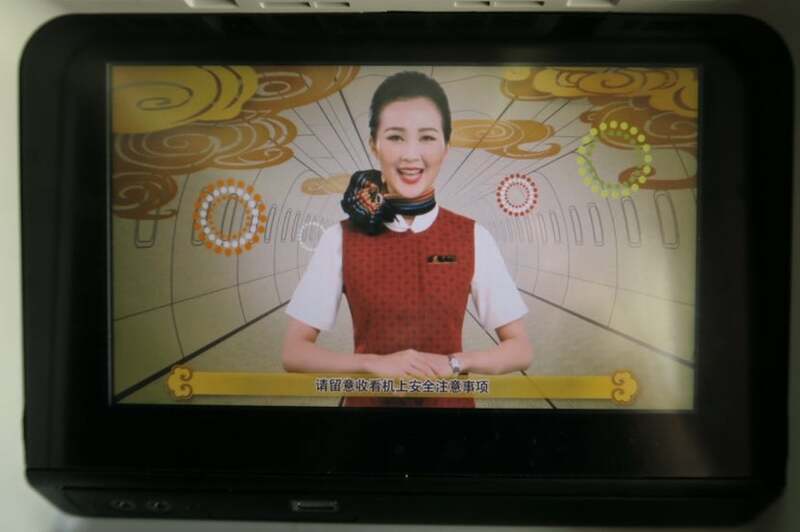 The Air China safety video gives you an idea of what the flight attendants actually wear. The Air China flight attendants asked not to be photographed, but dressed similarly to the FAs in the safety video — although in real life, their demeanor isn’t as cheery. They generally understood little English, although some could give instructions and make announcements in decent English. Multiple times, an FA spoke to me in Chinese, and thankfully, my Chinese seatmate was happy to translate for me. However, he couldn’t help much when a FA just barked “hello hello” and stared at me. I eventually figured out that she wanted me to turn off my laptop. After the cute safety video – which features animated pandas and children – we pushed back around 3:06pm (16 minutes late) and took off at 3:24pm. 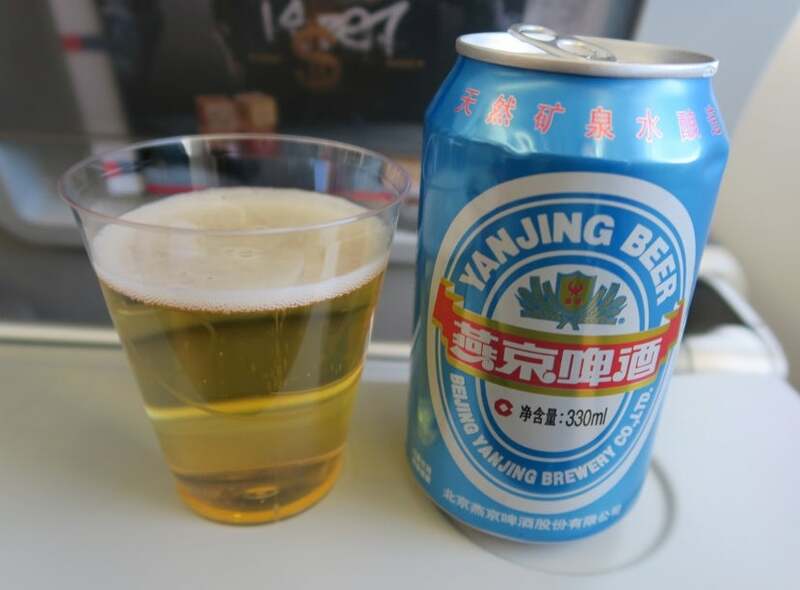 The Yanjing Beer served on board is a pale lager. Drink service started about 30 minutes after takeoff, with a choice of sodas, orange juice, tomato juice, beer, tea, coffee or water. At my seatmate’s insistence, I got a Yanjing Beer, a tasty pale lager. My chicken and rice dinner, with all the trimmings. Meal service and another round of drink service started just 15 minutes later. There was no menu provided; it was simply announced over the intercom that there was a choice between “chicken and rice” or “fish and rice.” I chose the chicken, which tasted quite similar to what Americans might think of as take-out Chinese food. It was served with raspberry yogurt, a side of crab salad, some melon and a warm roll. The plastic-wrapped utensil set was the same you’d expect from a take-out restaurant. Overall, I was pleased with the taste and the amount of food served for dinner. On the second drink service, I opted for wine without knowing whether it would be red or white. Fortunately, it ended up being a decent red house wine to pair with my meal: Great Wall Cabernet Sauvignon. The fairly extensive entertainment selection. There was a fairly extensive entertainment selection, including new releases from the US and movies in a variety of native languages. The movie theme for the month was “Youthful Vigor” and included High School Musical 3, Pitch Perfect and a dozen other similar films. (As I was headed to a robot soccer competition, I opted to watch the robot-themed movie Chappie with dinner.) Meanwhile, I used the USB plug to charge my phone. Shortly after meal service was completed, the FAs shut down the cabin for the “night,” despite the fact that we would be traveling with the sun the entire flight. I used the nice touch-less washrooms, reclined my chair, used my own earplugs and eye mask and slept easily for the next seven hours. Sausage rice for dinner #2. I was awoken to the start of second dinner. The choices announced were “sausage noodles” or “sausage rice,” and I chose the latter — but found it was actually dark-meat chicken rather than sausage. (Ditto with the “sausage noodles” that my seatmate received.) This meal wasn’t nearly as good as the first, and included a cold, stale roll and a wilting salad. As with first dinner, the FAs picked up dinner trays far too quickly. I wasn’t finished eating either time, although I seemed to be in the minority; fortunately, the FAs didn’t complain about having to come back later to collect my tray. Shortly after second dinner was complete, the FAs prepared the cabin for landing. We seemed destined for an on-time arrival, but circling for 30 minutes, holding on the ground for another 30 minutes and then waiting another 15 minutes before the doors opened caused us to be late. After experiencing these delays — and those on my next segment — I’m less surprised to hear about Chinese passengers opening emergency exit doors on the tarmac (although it’s still not okay!). I’d fly Air China again — if the price was right. 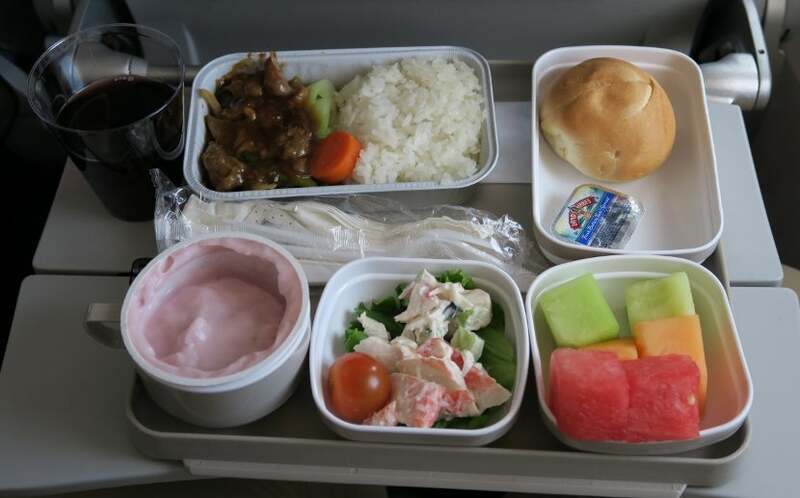 Overall, I would fly Air China again — if the price was right. The seats were comfortable, the entertainment system was well-stocked and we got to our destination close to on-time. 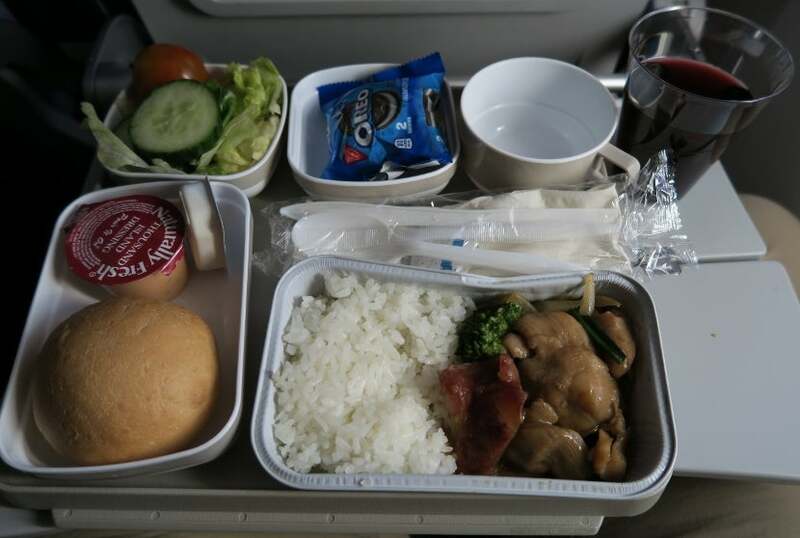 The FAs not understanding adequate English, the sub-par second dinner and the lack of amenity kits were annoyances that I would gladly overcome to fly New York to Hong Kong for cheap (currently $633-658 round-trip). However, I certainly wouldn’t seek out Air China at a standard price as I would with my most recent deeply discounted economy experience on Etihad. Have you flown Air China? Please share you experience with us in the comments below.